As part of the virtual lab initiative, OLabs emulate a one-on-one tutoring system allowing a student to do the experiment anytime and anywhere. The OLabs support different learning styles and learning preferences through tutorials, animations, videos, graphics, simulations and summary with detailed information. Each lab is designed to give the student a real-life experience to enhance students' learning and understanding of each experiment. A proper introduction to each experiment is given through the ‘Theory' tab. There is also an online procedure for each of the experiments under the 'Procedure' tab that gives detailed step by step instructions on how to perform the experiment in a traditional lab and also how to use the online simulator. The Animations help a student gain understanding of how to perform the experiment with hints, tool tips that show measurements, working of the equipment and other relevant information. The 'Video' tab shows the video of the experiment as done in a traditional lab. The Simulation can be used to perform the experiment interactively. The experiment can be performed by clicking on the 'Simulation' tab and following the step-by-step instructions as given in the ‘Procedure’ tab. 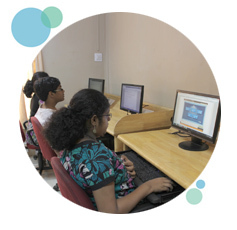 Facilities are also provided for a student to check the result obtained. A student, having performed the experiment online can do a self-evaluation through the Viva Voce module. This tracks what a student knows and has learned about a topic. It can be used before, during, and after performing the experiment. The data obtained from this module is logged for later analysis. The 'Resources' tab provides information on the list of books, videos and links to sites that support the particular experiment content published on the OLabs website. Information is also provided for additional reading materials. The experiments hosted through the OLabs website can be shown to group of students or a class in an audio visual room using a projector. By its very design, an online lab cannot be identical or equal to an authentic traditional lab. However, OLabs are equivalent in value to the learner because they address different learning styles and offer a more flexible and open ended environment for inquiry. A significant fraction of students go through traditional laboratories with little thought about what they should learn. A prime factor behind this tendency is the rigidity imposed upon physical laboratories by severe time constraints, large numbers of students, costs, environmental considerations, and safety considerations. Another area of expense is the requirement of competent and adequately trained staff that can provide effective guidance to students. All these factors increase the cost of running and maintaining a physical laboratory. The OLabs provide the following benefits: it allows the freedom to explore, repeat procedures, and is easy to use. As online reactions are quick, they can be repeated multiple times, giving students’ confidence in their results. An often neglected, but important component in making learning effective, is the assessment for learning, as traditional assessments for labs are often limited to theory and multiple choice questions. Learning is measured using the 'learning-enabled assessment' through the OLabs that facilitates the assessment of: the procedural and manipulative skills of the experiment, the concepts and understanding of the experiment and a student’s reporting and interpreting skills. It helps the students prepare themselves before attending a lab by becoming acquainted with the equipment, going through pre-lab exercises and taking pre-lab quizzes, both on the content of the work and on the safety considerations of the lab, all through online exercises. Teachers can submit their contributions that include assignments, activities, concept questions and more. For making contributions or modifications on existing content you can use the 'Contact Us' page. Click here to know how to register.